MacGillivray, A. (2009). Book review of Digital Habitats: Stewarding technologies for communities by Wenger, White and Smith in Emergence: Complexity and Organization, Vol. 11 (4) pp. 99-104. For years, Etienne Wenger’s concept of communities of practice has been a powerful but secret key to understanding successful group efforts. Now Wenger, Nancy White, and John D. Smith have made the concept both more powerful and less secret, by explaining what communities of practice are, and how to support them using simple communications tools. The book is clear, detailed, and laden with examples; it will be invaluable for anyone who wants to nurture group work. This book is a rare and rich seam of depth and quality – one that the reader can return to time and time again, discovering new gems on each occasion. The authors have not only succeeded in their goal to create a resource which meets the needs of multiple audiences, they have done so with style. Multiple styles in fact – visual, conceptual, practical and factual, case-study based diamonds sparkle from every chapter. This team of experts has taken a very complicated subject and assembled the information in an easy to read, easy to understand, and (most importantly) easy to use format. The real-world examples in each section bring the concepts and discussions into sharp focus and allow the reader to frame those lessons around their own personal and professional experiences. The extensive references to source documents, be they papers, books, or links to websites, will prove invaluable to both novice and expert community members, as well as to members of the IT community trying to figure out how best to support their own communities. The Reader’s Guide and Action Notebook are nothing short of brilliant; I have already shamelessly cut those pages out, have laminated them, and now carry them with me as a reminder of all things I should be remembering. In the business world where plenty of focus has been placed around the topic of communities over the last couple of years, we may have reached that point in time where it’s becoming yet another buzzword. Everything out there, every single grouping you can think of, seems to be flagged as community nowadays. But what is really a community? How do you get to nurture communities in a business environment? How do you manage to successfully build, sustain and help mature new, or already existing, communities? What community tools are available out there for them? Can new, emerging technologies from the Social Computing era help develop healthier communities in such a distributed world as today’s? Whether you are just getting involved with communities, whether you have been building communities for a while already, or whether you think there is nothing more to learn around the topic of communities in a business environment, “Digital habitats: stewarding technology for communities” by Etienne Wenger, Nancy White, and John Smith is just the right book for you to get answers to some of the questions mentioned above and many more! In this particular, very well written, enlightening as well as educational, book you would be able to get plenty of hints and tips on how to get your hands around not only building successful communities, but also explore the mutual influence that technology has always been having in them. If there would be a single book that you would want to read this year around the topic of communities and the reciprocal influence of technology in them, including the fascinating role of social software and other community related tools, “Digital habitats: stewarding technology for communities” by Wenger, White, and Smith would be it. Without a doubt! Only a few years ago, we used to routinely talk about technology merely “enabling” Communities of Practice. This simplistic approach is now hopefully merely a cliché; this excellent book clarifies the complex relationship between emerging technologies and communities by providing new models to guide and develop our thinking. Wenger, White and Smith explore the subtle interplay of tools, practices and communities, and in so doing takes our level of understanding about this fascinating subject to a new level. Communities of practice have long been valuable to businesses by helping employees to share knowledge, help one another, and reuse proven practices. 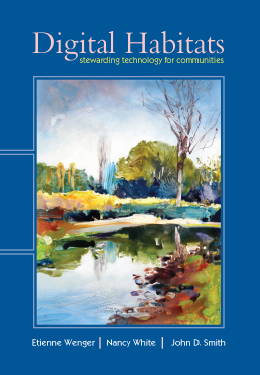 In Technology Stewardship for Communities, Etienne Wenger, Nancy White, and John D. Smith introduce technology stewarding, a new kind of community leadership. They help community leaders choose the right technology strategy, including using existing tools, free tools, enterprise platforms, commercial platforms, custom applications, open-source software, and elements patched together. Etienne, Nancy, and John are respected thought leaders, authors, bloggers, and community activists, particularly in CPsquare and com-prac. They practice what they preach, using communities to help learn about and improve communities of practice as a business discipline. This book provides a practical compilation of what they have learned, and it should be very useful to both new and experienced community leaders and practitioners. This is the definitive guide for anyone with the responsibility to select, juggle, adapt and connect technology to best support their communities of practice. An instant CoP classic. — Shawn Callahan, Anecdote Pty. Digital habitats: stewarding technology for communities” is truly remarkable. For technology stewards at all levels of practice, it’s inspiring, eminently practical, grounded in hard-won experience, and full of tips and lessons learned. Wenger, White, and Smith provide frameworks for thinking systemically about the wealth of technology tools available, how they might work together in practice, and how stewards find, choose, and use them to support diverse communities. Their focus is on the evolving interplay of community and technology — and how each continually shapes the other. Whether you’re a brand new technology steward, a “just do it-er” looking for concrete, practical information to use today, an “attentive practitioner” who wants to reflect on, develop, and deepen your stewarding practice; or a “deep diver” looking for insights about history, theory, and the future of technology for communities; this is the book for you. Many books are interesting, fewer are useful on the ground, but a book that combines deep, thoughtful insight with practical advice and guidance is a rarity. This book is one of those rarities. It is an incredibly thoughtful and useful book written by a tight team at the cutting edge of their practice. It will define the way that communities and networks look at – and take a more informed responsibility for – their technology platforms and tools. Knowledge managers have often been placed into a false polarisation between “people-oriented” initiatives (human and naturalistic) and “technology-oriented” initiatives (logical and constrained). In this book we start to recover a vision of technology as it was originally intended to be – an instrument of human action – and learn the principles for how to steward it wisely for collective learning, collaboration and growth. A practical guide for community facilitators who need to make technology choices–it helps identify the activities relevant to your community, the tools that might help, and the strategies to obtain them. It also provides helpful tips for making the most of technologies once they’re up and running and a glimpse into the future of community technologies. What a wonderful book! Although the audience focus is on those who need to understand, select, try out, introduce, troubleshoot, and enhance the use of web-based tools for communities of practice, this long-needed book provides working models, insights, and templates that can be applied to social networks of any type. Working with people and knowledge may be 90% people and only 10% technology (as many have said), but it is really important to get that 10% right: everything must work in the context of the current community. This book is the practitioner’s sourcebook and is the much-needed companion to the COP’s touchstone, Cultivating Communities of Practice. Only Etienne, John, and Nancy could have written this book, and I am so glad that they have. Though communities of practice and other collaborative workgroups find substantial and evolving support online, the growing scope and diversity of emerging social technologies presents a challenge – how do you keep up? This book offers a solution, a new role – technology steward, someone within the organization who can manage, monitor, and recommend platforms for collaboration. _Digital habitats: stewarding technology for communities_ defines the role and serves as a thoughtful, comprehensive guide for communities, and for those who, knowingly or not, fill the stewardship role. Beyond that, this is essential reading for anyone who needs or wants a better understanding of social and technical aspects of computer-mediated community.